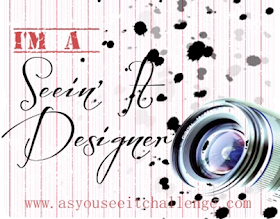 Playing with Papercrafting: It's Here! 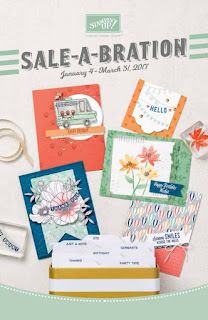 The 2017 Occasions Catalogue and Sale-A-Bration! It's Here! 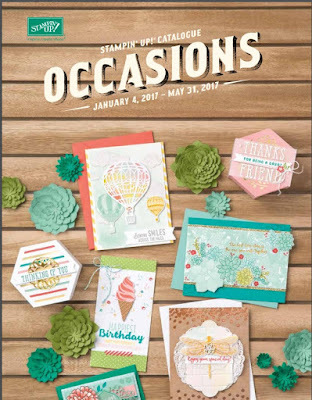 The 2017 Occasions Catalogue and Sale-A-Bration! Please let me know if you would like your own hard copy of the catalogues and I will see that you get them. You can email me or text me at 250-768-7379. Sale-A-Bration works like this: For every $60 you purchase on one order, you earn a free product that you can choose from the Sale-A-Bration Brochure! It's as easy as that! Just make sure your orders reach those multiples of $60 before shipping and tax. 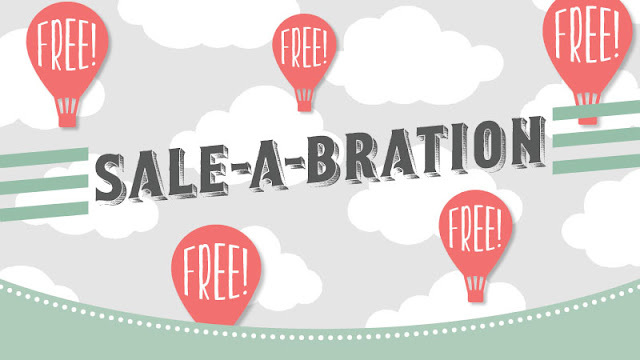 If you join my Stamp Club and have your Reward Month during Sale-A-Bration, or if you host your own party during Sale-A-Bration, you only need party sales to reach $330 to have your rewards increased by $35 more dollars! 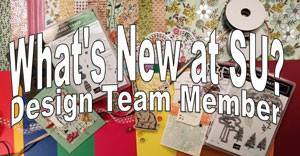 And if you join my team and become a demonstrator during Sale-A-Bration, you get to choose two free stamp sets of any value to add to the already great deal that your Starter Kit already represents! Now, one of the first things we are doing this year, as a group of Stampin' Up! 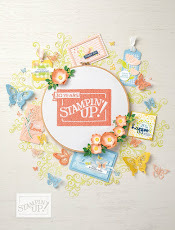 demonstrators in our group is to have a Shoebox Swap based on new stamp sets in the new Occasions catalogue! 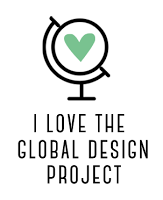 Basically, each demonstrator attending designs a card using a new product and then cuts enough projects for everyone else attending and puts all the supplies to make that card in a shoebox. When we get there, we each take a shoebox and make the card in it, then pass it on to the next person, and make the next card and so on until we've created all the designs that were brought that night. We go home with a bunch of great ideas for our classes, lots of fun and laughter and deeper old friendships and delightful new ones! How great does that sound? My card started with shades of Crumb Cake and Early Espresso, but evolved into Basic Black, Smoky Slate, Silver Foil and Delightful Dijon. It all came down to the Urban Underground Specialty Designer Series Paper I wanted to use - the 2" strip at the top. It worked much better with the latter colours. 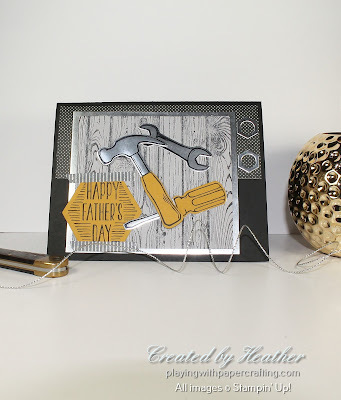 The wood panel needed a backing and Silver Foil was perfect, but it's not cheap and there is a way to get that for the backing and all the silver for the tools and nuts without using extra foil. 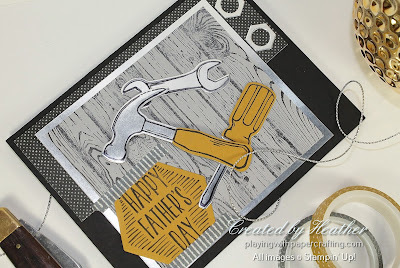 It's quite possible to stamp all the tools in the center of the foil and die cut them with the Build It Framelits, along with two nuts, without having it show at all as you use the foil to back the wood panel. Just smart use of your paper. The hammer and screwdriver were also stamped in Basic Black Archival Ink on Delightful Dijon cardstock and die cut. Then the handles were cut from the rest of the tools and glued onto the Silver Foil version of the same tool, matching up the stamped lines evenly. 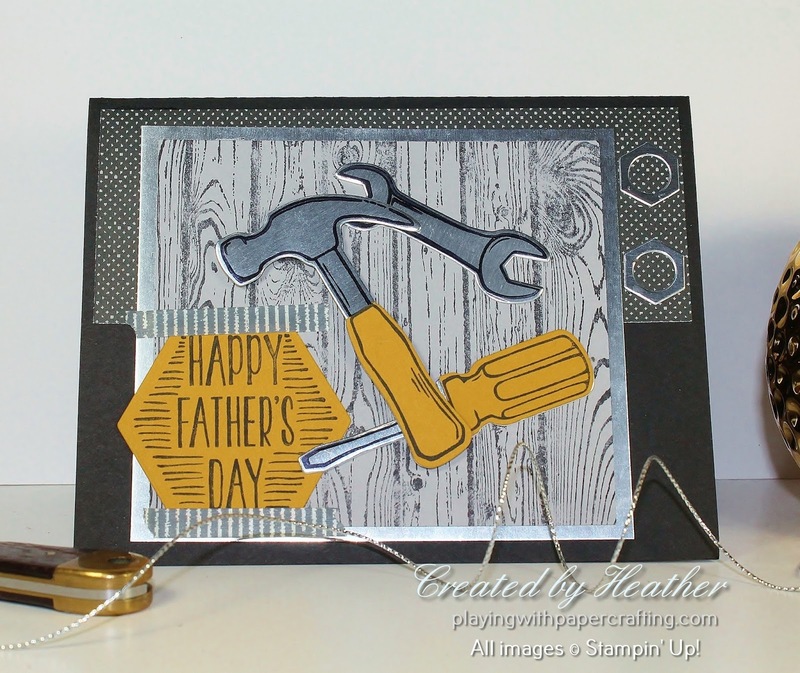 The sentiment is from the Nailed It set and there is a matching hexagon die. I used the coordinating Urban Underground Designer Washi Tape to secure it on the card. Well, I won't hold you up any longer. Go and pour over that catalogue! And drool! And make your Wish List - your loooooong Wish List! Let me know when you decide!